People using iPad are usually aware of making their backups through iTunes or iCloud. However, the thing on which they fret is extracting in hassle-free way. Therefore, today in this article, we have brought top 10 iPad backup extractors that are certainly going to help you a lot. So, without moving any further, just scroll down the page and know each of the extractor carefully. Speaking of the top 10 iPad backup extractors here is a list of the most coveted tools that you can use to enhance the experience. The first in the list of top 10 iPad backup extractors is Any iOS Data Recovery. It enables you to preview and then restore lost or deleted data, either completely or selectively. Data can be recovered (extracted) from your iPad/iTunes backup/iCloud backup. More than 20 types of data can be recovered from your iPad along with FaceTime and app data. It fixes various iOS issues and causes no data loss during recovery. Step 1:	Download and install the tool on your computer and run it. Click 'Recover from iTunes Backup File' tab on the main screen. Select a backup file that contains your lost data and click "Start Scan". Step 2:	After scanning the data, you will see all the data backed up by iTunes. 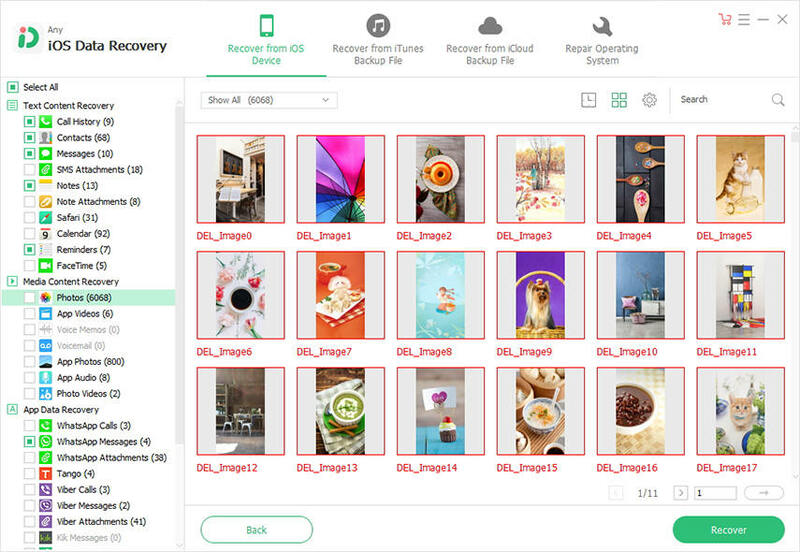 Select your target files and click on "Recover" button. With this software, you can preview and selectively extract data from iTunes, iCloud backup and your iPad. Exporting and printing from iTunes backup is possible. This iPad backup extractor can work on Windows and Mac systems for extracting data and managing or transferring files between smartphones, iOS devices and computers. Data from iOS device, iTunes and iCloud backup can be extracted and previewed. This iPad backup extractor can recover 20 plus data types on your Mac or Windows system. You can export data directly to your iOS device. Deleted encrypted iTunes/iCloud backup data can also be extracted. You can extract iPad data such as SMS, MMS, iMessage, and WhatsApp using this software. Recover various data types and create new backups for your iOS device. This tool can show your phone screen on your computer. You can export and import data between computer and iOS device. There are 3 ways to backup and restore iPad data. No support to iCloud backup and inefficient scan time. This can extract data from iTunes as well as your iPad. You can preview files before recovery and transfer data between computer and iOS device. This free top iPad backup extractor can work on both Mac and Windows systems. You can extract data from iPad or iTunes backup. It helps you extract and recover a varied range of data from iCloud and encrypted iTunes backup. You can transfer, download iCloud data, and recover corrupted, deleted or lost data from your iPad. You can use it on your Mac and Windows systems alike. This was the elaborated list of top 10 iPad backup extractors. Also, we understood that choosing UltData iPad backup extractor will be the best idea because it works flawlessly and without any limitations. You can extract iCloud or iTunes backup smoothly and by following three easy steps. We hope this article interested you and you got the best out of it. Thank you!